ORIGINAL: Uh oh! Looks like MattyCollector.com goofed! 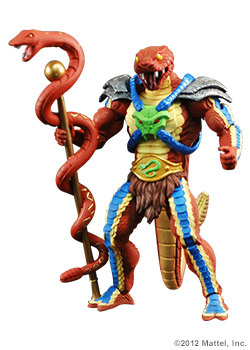 In the listing for the product going on sale October 15th, 2012, Masters of the Universe Classics Rattlor is shown wearing his general armor! This definitely appears to be a goof, since we already know that Rattlor does not include this armor. Scott “Toyguru” Neitlich did tell us at San Diego Comic Con that the armor had been sculpted, but it was cut from the figure because of cost. He also said they were hoping to release it in a future weapons pak. But now this picture has shown up on Matty. The problem is that this is sure to confuse some folks, and will certainly bum a lot of folks out seeing something they won’t be getting. But at least we get to see what the armor looks like! Fingers crossed it’ll show up somewhere down the road. Mattel has yet to comment on the photo. I’ll be sure to keep you all updated! Well at least we know not to expect it with the general, uh Rattlor. Wow, will they ever stop messing up? eh, its a simple mistake. The sky certainly isn't falling. I think they did this on purpose as a marketing tactic. It is a way to encourage people to buy weapons pack #4. This was my first thought when I saw the picture. They should have kept the armor and ditched the lame repetitive staff. Maybe his armor is the gift for the Frosta mess-up? I was thinking something similar. Maybe it would come with a figure that has little or no accessories. Hopefully not a New Adventures figure because I know so little about that I haven't opened Slush Head. Not a big deal. This is an all out awesome figure with or without the 200x armor. meh, I like him better without the armor. Nope. Just a simple mistake per Scott. I just updated the post above with the details.